In the olden days, we often had large paper calendars hanging on the wall in the central point of the office. This way everyone was able to see the current work schedule and also check the upcoming months. Today, when offices are often spread over many locations, not only inside one building, but also all over the globe, using the wall calendar is not practical anymore. That’s why we’ve all switched to digital calendars, which enable us to add or change appointment and make notes in a blink of an eye. But we still need the ability of sharing Outlook calendars with others. CodeTwo Public Folders is an easy to use application that allows everyone in your office to share Outlook calendars with each other. You can share data between two or more computers in a local network or over the Internet. All in a secure, reliable way, without using the Cloud. Because most businesses don’t really have the need or desire to host their own email server, CodeTwo Public Folders is an ideal alternative to Exchange. It is simple to install, configure and maintain. It doesn’t require expert IT knowledge, is far less expensive and allows you to share Outlook calendars and other files with ease. You are capable to sync your personal Outlook calendars across desktop computers, notebooks and even mobile devices (using Android and iOS). You can have the same data in all your devices and stay up to date, no matter which one you are currently using. You are able to not only sync Outlook calendars in a local network, but also over the Internet – regardless of your location and without a Cloud-service. It’s convenient and secure. In your local network the application will synchronize your Outlook calendars via LAN/WLAN, and when you are away on a business trip it will sync your calendar securely via the Internet, using encrypted data transfer. 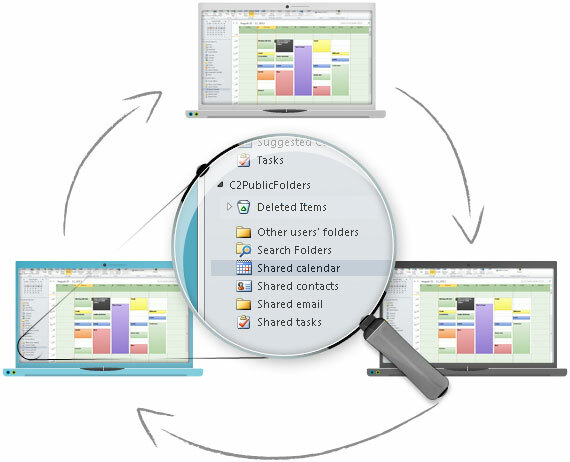 With CodeTwo Public folders you can conveniently organize meetings or schedule appointments. A shared calendar makes it easy for the entire team to stay up to date with all important events. CodeTwo Public Folders also allows other people to access and make changes in the public calendars. Access rights are defined by administrator. Authorized users can sync their appointments within a single calendar view, creating an integrated group schedule. Furthermore synchronization between computers is safe. The data transfer is encrypted and is being stored only on your PC, not in the Cloud. A group schedule can contain all the necessary contacts and resources from public folders. 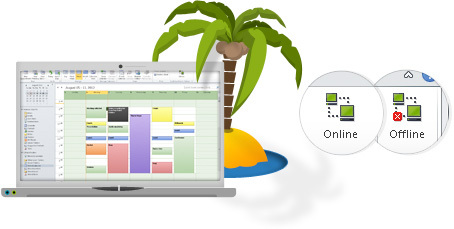 You are able to create multiple group schedules, each showing a group of people or resources. You have capability to check who is available, reserve the conference room and other vital resources. Set permissions, provide access to members – CodeTwo Public Folders provides you with all the necessary tools to organize a successful meeting. The application lets you access and work with public calendars even if there is no physical connection with the company network – offline mode. For example, when one of the users changes the details of a meeting in a public calendar, normally the data on all Outlook Add-ins active in the network is immediately synchronized by the Syncing Master; when the user is offline, the only difference is that the synchronization starts right after he/she reconnects to the network. Any changes in the public calendars are replicated in the entire network immediately after being introduced. All users with access to the folder can see new events in real time, which reduces the number of emails being sent within the group. CodeTwo Public Folders enables you to easily inform your assistant on what days you are available for appointments, without the need for email or direct communication.